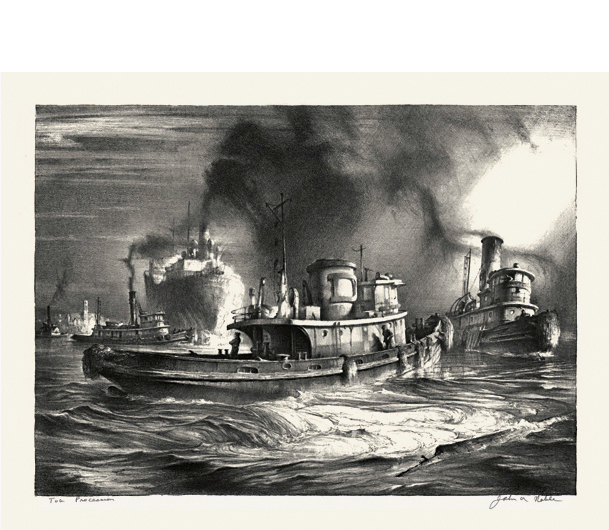 Tug Procession, Four Generations of Tugs off Staten Island - - 1949, Lithograph. Urban 15. Edition 200. 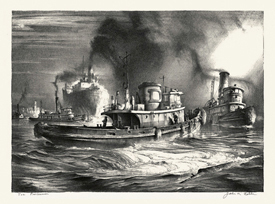 Signed and titled in pencil. Image size 11 5/8 x 16 inches (295 x 404 mm); sheet size 14 x 19 1/8 inches (356 x 485 mm). A fine, rich impression, on off-white wove paper, with full margins (1 1/8 to 1 3/4 inches), in excellent condition.